I love my CSA box. I get so many amazing vegetables every week that I would never think to buy on a regular basis. I mean, I would buy french beans, but I probably wouldn't get Indian eggplant when Japanese eggplant was an option. Most of the time, I would have probably just chopped up this eggplant for curry or a stir fry. This time, that didn't happen. My CSA company sends an email every week with a recipe at the end to give you inspiration. 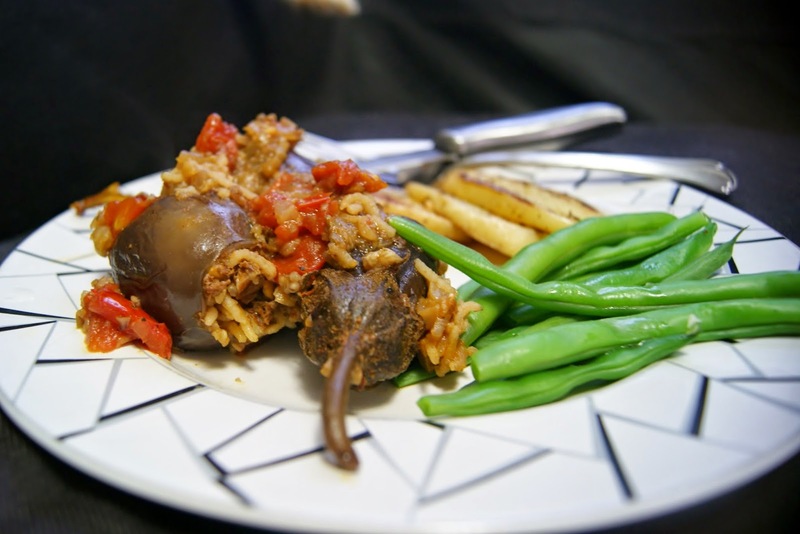 This week, they sent out an adapted version of Smitten Kitchen's recipe for stuffed eggplant. This was an absolutely delicious dish! The flavors all went so perfectly together and the eggplant was beautiful. The recipe I used was altered in order to fit what came in the box that week. I highly recommend you all try it. Cut the bottom sliver off each eggplant and hallow out the eggplant with a melon baller, leaving about 1/3 inch eggplant flesh on all sides. Take the interior of the eggplant and roughly chop it. Heat a little olive oil in large skillet. Sautee onion and garlic until tender. Add the eggplant interior and cook until tender. Place half the onion mixture into a bowl with nuts, ground meat, rice, allspice, lemon, 1 tsp salt and 1 tsp pepper. Mix together. Stuff eggplants with the rice filling mixture. Filling will expand, so don't stuff it too tight. Place eggplants in the simmering sauce and simmer covered for about 45 minutes, turning halfway through. Cook until rice is cooked through. If necessary, remove eggplant and reduce sauce to desired consistency.